Originally, LTE was designed for large-scale carrier networks to cover entire countries. More recently, two factors have enabled the rise of Private LTE networks: firstly, a range of compact, stand-alone and designed-for-purpose LTE systems, and secondly, the availability of easy-access spectrum including the unlicensed 5GHz band – are now available to enable organisations to implement wireless networks for mission-critical automation and mobility applications. Private 4G solutions make it possible for private organizations to deploy and operate high-performance, on-premises private wireless networks, without requiring access to licensed spectrum, yet still benefit from the performance and global ecosystem of LTE technology. This is attractive across a wide range of enterprise applications, particularly where in-house control, mission-critical reliability, multi-service capability, mobility and security are needed. Globally, most LTE networks are public – serving both public or enterprise subscribers from operator-owned networks. An LTE network is considered to be private when its main purpose is to connect people/things belonging to an enterprise (normally across a campus or site), and where data needs to be kept totally secure by avoiding transmitting it through the core network of a mobile operator. Full private ownership of the whole LTE network – including Base Stations and Core – has several advantages. Guaranteeing coverage and capacity in the target coverage area. Organisations can design, engineer and update the RAN to meet their specific performance demands, including for coverage, configuring uplink and downlink, set usage policy, determine which users connect, how traffic is prioritised, and other key parameters. Optimising parameters in the LTE radio to operate in challenging physical environments (e.g., warehouse or oil/gas facility with lots of metal). This can include fast recovery from failure, or optimizations for reliability, and for latency. This is not possible when connecting to a public network, where such parameters are under control of the operator, not the user. Retaining control of critical data: In private networks, the organization controls its own security and can ensure that sensitive information does not leave the network; this is an essential requirement for many types of businesses and security-focused organisations. Another benefit of keeping data and the core network on the private LTE network is the risk of service disruption due to a WAN link outage is eliminated. Early examples of private LTE networks were typically deployed in licensed spectrum with permission from the regulator or partner mobile operator, the availability of open access spectrum in combination with built-for-purpose, interoperable equipment, makes it easier for organizations to deploy and operate a private LTE network. Licensed and Unlicensed: Where there is choice, organisations can decide whether to deploy with unlicensed 5GHz, or licensed band operation. Some organisations, especially Government, Security, Energy & Utilities can get access to spectrum to run private LTE Networks. An organisation deploying Private LTE can choose vendor equipment with roadmap that suits them; quality modern equipment such as CableFree includes Software Defined Radio and Software Defined Networking with easy roadmap to 5G and beyond. The upgrade cycle of software and/or hardware can be under the user’s control, and meet demands for coverage, capacity, applications and network features. CableFree LTE solutions for Private LTE networks are available in all LTE bands from 450MHz up to 5925MHz, including licensed and unlicensed LTE bands. 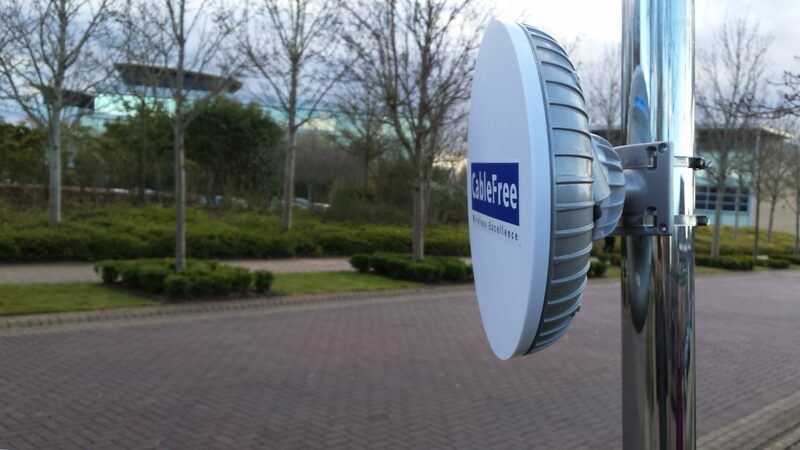 CableFree offers Small Cell and Macro Cell products in licensed spectrum, or 5GHz MulteFire and CBRS small cells that allow enterprises and other professional organisations to deploy their own private LTE networks in Licensed and Open-Access Spectrum. In addition to EnodeB LTE Base Stations, CableFree offers core network, customised private SIM cards and CPE devices to build complete “Stand alone” LTE solutions.